Bowser's Magma Mountain is Bowser's unlockable board in Mario Party. It is purchasable from the Mushroom Shop for 980 coins. Players need to collect Stars to "defeat" Bowser. The board is set on a huge volcano with a one-way path to the top of the board, but with many junctions. Every junction has a green volcano-head statue with a Star sign, and Bowser's face. Bowser's voice is heard, asking players if they want to take a shortcut up the mountain for 10 coins. If the player accepts, then they must pay the fee, and a roulette block will appear showing a Star and Bowser's face. If the player gets the Star, they are allowed to take the shortcut. However, if they get Bowser's face, they have to continue on their present route with no refund. A purple volcano-head statue is on the top of the mountain, and is the most important one. When a player gets here, they are forced to hit another roulette block (this one free of charge). Getting the Star picture takes them to Boo, and Bowser's face takes them to Bowser, where he steals either coins, or a Star (depending on yet another roulette block). 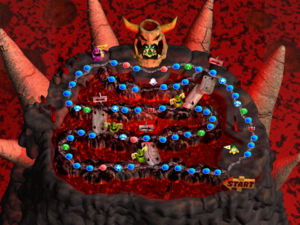 If a player steps on a Happening Space, the volcano erupts, sending flaming rocks on the board and turning all the Blue Spaces into Red Spaces for two turns. If a player buys a Star, the space the Star is bought from becomes a Chance Space. At the end of the game, the winner's Stars form into a large Star that charges up, and destroys the volcano part of the mountain that Bowser is in, sending him flying upward and falling back down on his side. As Bowser wallows in pain, the winner jumps on him, then in front of him, as the players in 2nd, 3rd, and 4th watch. Toad, Koopa, Boo, and the Star soon joins them. There are no Chance Spaces initially on the board, though every time a Star is bought from Toad, a Chance Space replaces the space he was on. Finally, it is time to deal with Bowser. So give a shout, and get to work! Bowser is to be found at the summit of the volcano. Be careful not to pass in front of it. Bowser will attack you with a volcanic eruption, so beware! If the volcano erupts, the path will become a sea of red. Surely, everyone will feel the difficulty. The volcano's rocks protect Bowser, making him invincible. First, something must be done about that. Maybe you can break the volcano down with your Star Power. Yoshi traveling on the board. The board for sale in the mushroom shop. This board is one of the only boards that the No Boo item doesn't work on (except for Eternal Star, and Peach's Birthday Cake, which does not have a Boo). This is one of the two boards where nothing bad happens to the 4th place player at the end of the game. This board's music references the music from Bowser's Keep in Super Mario RPG: Legend of the Seven Stars. This page was last edited on December 18, 2018, at 04:08.